NetBeans is a free and open-source integrated development environment (IDE). It supports the development of all Java application types (Java SE, Java ME, web, EJB, and mobile applications) out of the box. 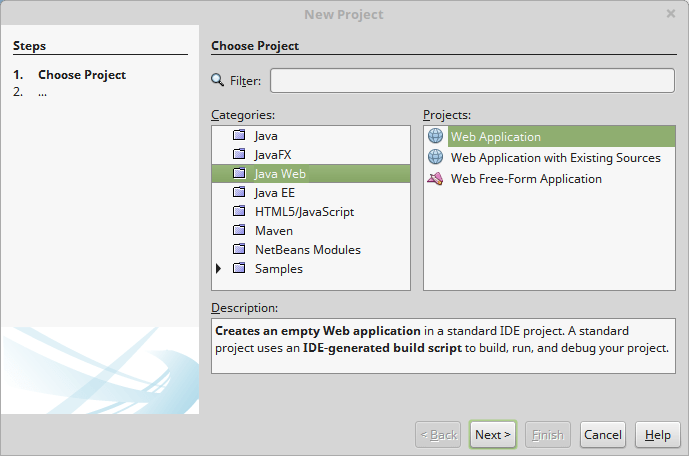 All the functions of the IDE are provided by modules, which allow NetBeans IDE to be extended. Each module provides a well-defined function, such as support for the Java language, editing, support for the CVS or SVN versioning system. NetBeans IDE contains all the modules needed for Java development in a single download, allowing the user to start working immediately. 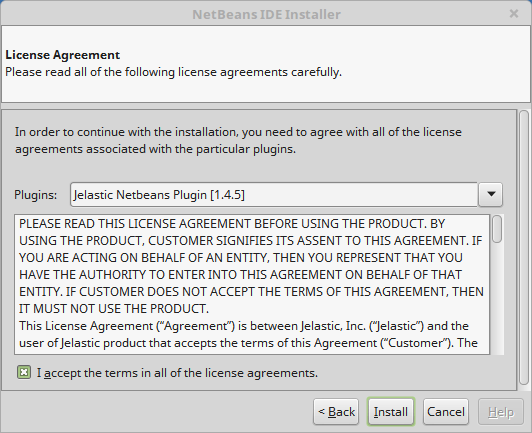 Use the following instruction to install the plugin and manage Jelastic environments through NetBeans IDE. 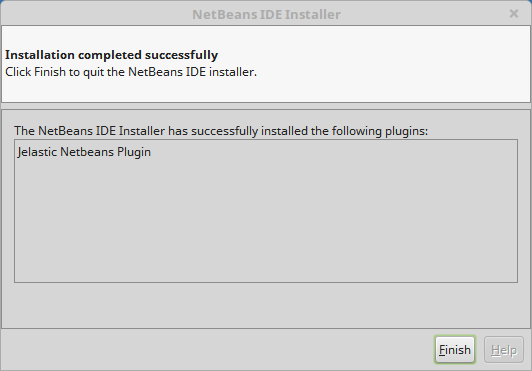 In order to start working with the Jelastic NetBeans plugin, you need to get it installed within the IDE. 1. 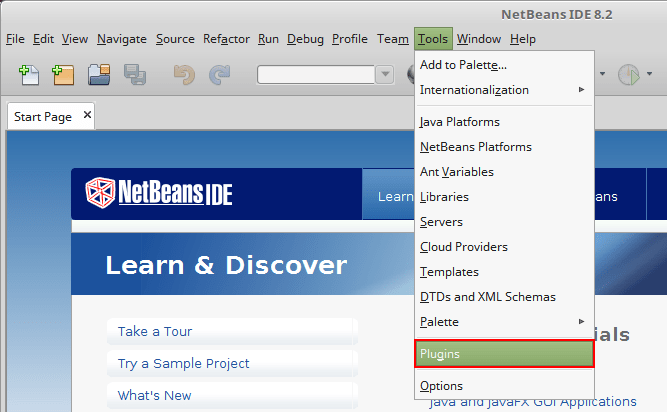 Run the latest version of NetBeans IDE (Java EE or All bundle) and navigate to the Tools > Plugins menu item. 2. Switch to the Available Plugins tab and enter jelastic in the Search field. 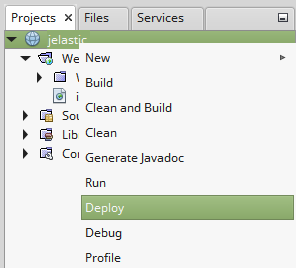 Choose Jelastic Netbeans Plugin in the list and click the Install button. 3. Click the Next button in the appeared window. 4. Read and accept the terms of the license agreement with the appropriate checkbox. 5. After installation success, close the window with the Finish button. 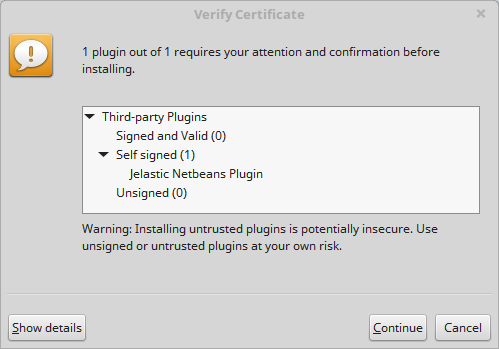 Tip: Before the last step you may need to Verify Certificate for the Jelastic plugin, click the Continue button to proceed. 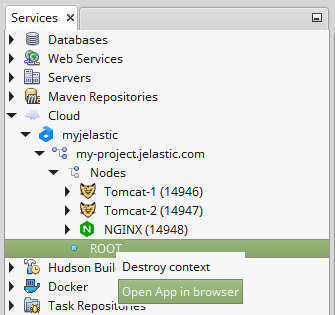 Now, you have Jelastic Plugin in your NetBeans IDE. 1. Navigate to the Window > Services menu item. 2. 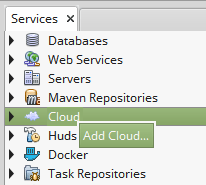 Within the opened section, right-click on the Cloud line and add a new cloud. 3. 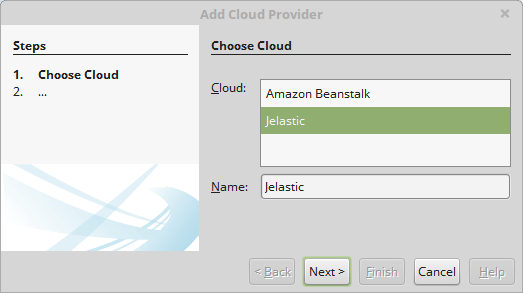 Choose Jelastic in the list of cloud providers and click Next. 4. 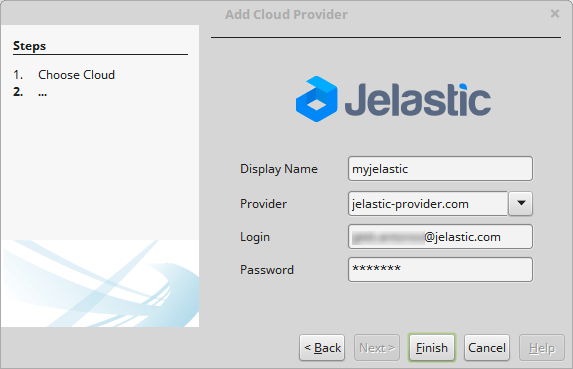 In the opened window specify Display name (any preferable name, for example, myjelastic), choose (from the drop-down list) or type your Jelastic hosting Provider domain, and fill in Login and Password fields with Jelastic credentials. Click Finish to establish the connection. 5. Now, if you expand the Cloud list, you will see a new one with the name you’ve specified. 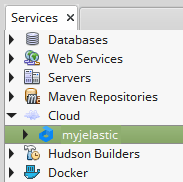 Note: To delete your cloud from NetBeans IDE, navigate to Tools > Cloud Providers. 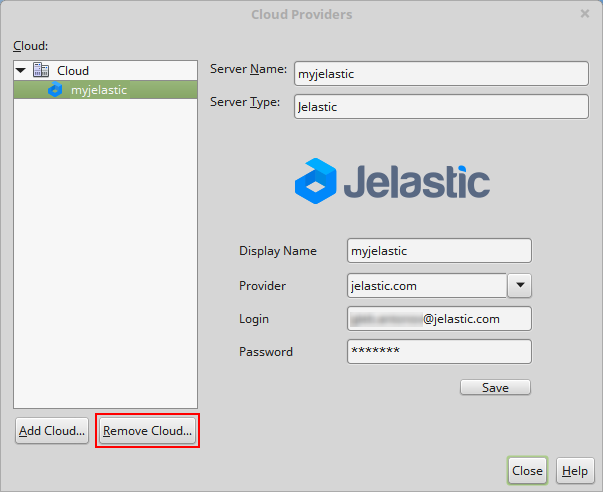 Within the opened window, choose Jelastic installation and click the Remove Cloud button. 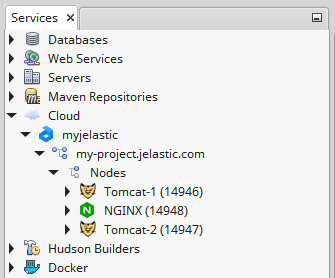 Now, as you have the Jelastic NetBeans plugin installed and connection established, you can proceed to the management of your existing Java environments via the Services tab. For that expand your Cloud list and choose the desired environment. 1. To stop an environment right-click on it and choose Stop environment. 2. If you want to run already stopped environment, right-click on it and choose Start environment. 1. 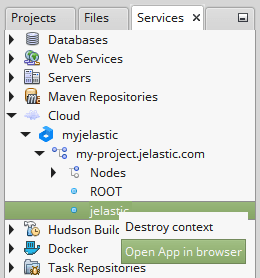 You can easily manage log files on your Jelastic instances directly in IDE. 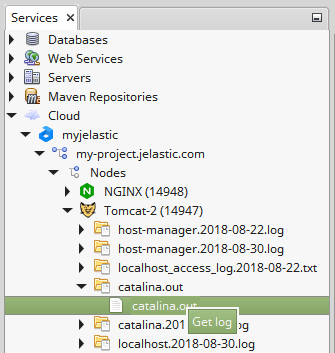 Expand the required node to find the log file you are interested in, right-click it and choose Get log (or just double-click). 2. Log file will be automatically opened. 3. If you want to save log file, choose the File > Save As menu item. If you have a deployed application, you can right-click on the appropriate context in the environment to open your application in the browser. Also, using this menu you can delete the chosen context. 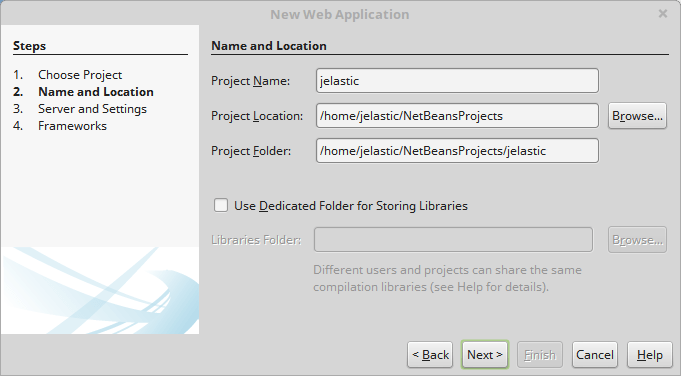 You can create own project in NetBeans IDE and deploy it right into your Jelastic environment. 1. 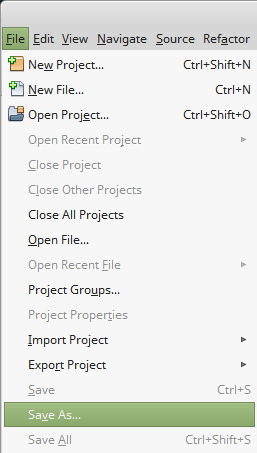 Click the New Project button in the upper tools panel of NetBeans IDE. 2. Choose the Java Web category and the Web Application project. Click Next. 3.In the opened window, enter the desired Project Name, specify Project Location and Project Folder. Click Next to proceed. 4. Select one of your environments in the Server drop-down list. If needed, specify the context and click Next one more time. 5. If you want to use frameworks in your application, tick the required ones and click Finish. 6. Your new web project will be created in a moment. 1. 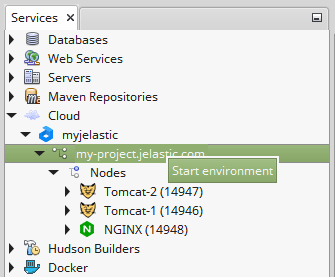 Right-click the name of your project and choose the Deploy menu item. 2. Next, the .war archive of your project will be built and deployed to the Jelastic PaaS. 3. To make sure everything works, open your application URL in the browser manually or automatically by clicking Open App in browser in the Services tab. As a result, your application will be opened. With Jelastic NetBeans IDE plugin installed you can easily manage, develop and deploy your applications without switching between the IDE and the browser. Get started now at one of the available service providers.